More impact: Chun-Li or Kitana? <div class="forumQuote"><b>diirecthit Wrote:</b><br/><br/>That's not what i asked.</div> <br/> <br/>You asked a lot of things. And my answer is still... Kitana. <br/> <br/>Chun-Li does nothing for me, cuz I don't care about SF. <br/> <br/>As for the other questions, I'm not arrogant enough to speak on behalf of the entire (non-)gaming community. RE: More impact: Chun-Li or Kitana? You asked a lot of things. And my answer is still... Kitana. Chun-Li does nothing for me, cuz I don't care about SF. As for the other questions, I'm not arrogant enough to speak on behalf of the entire (non-)gaming community. I think they are both even in my book. I love them both. <div class="forumQuote"><b>Thracian_Tsar Wrote:</b><br/><div class="forumQuote"><b>diirecthit Wrote:</b><br/><br/>That's not what i asked.</div> <br/><br/> <br/><br/>You asked a lot of things. And my answer is still... Kitana. <br/><br/> <br/><br/>Chun-Li does nothing for me, cuz I don't care about SF. <br/><br/> <br/><br/>As for the other questions, I'm not arrogant enough to speak on behalf of the entire (non-)gaming community.</div> <br/> <br/>If you're so good a following rules and don't want to be "arrogant enough to speak on behalf on non gamers" to answer the questions, then you shouldn't have replied at all, because "which one do you prefer" is not what i asked. If you're so good a following rules and don't want to be "arrogant enough to speak on behalf on non gamers" to answer the questions, then you shouldn't have replied at all, because "which one do you prefer" is not what i asked. I answered four of your questions: <br/> <br/>1. Which one had the bigger impact at the time of their debut? (Impact on who/what? Kitana has more impact ON ME. There you go...) <br/><br/>2. Which one is more popular among MK fans...? (Chun Li has nothing to do with MK. There you go again...) <br/><br/>3. Which one is more popular, and important to their respective series? (Kitana is more important to MK than a non-MK character. Duh...) <br/><br/>4. Who is the better and bigger fighting game icon overall? (Kitana for me. I tend to find Chun Li a generic character in a popular game, hence her "classic" status.) <br/> <br/>It's obvious you don't like my answers. The whole point of your topic is to downgrade Kitana. Why would you compare Kitana to Chun Li? What's next - Ken vs. Kenshi? 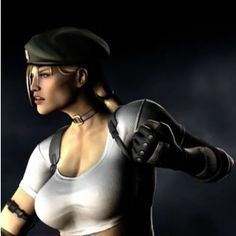 <br/> <br/>MK's first classic, iconic and only chick was Sonya. A comparisson between Sonya and Chun Li could have worked... kind of. Still pointless, tho. It's obvious you don't like my answers. The whole point of your topic is to downgrade Kitana. Why would you compare Kitana to Chun Li? What's next - Ken vs. Kenshi? MK's first classic, iconic and only chick was Sonya. A comparisson between Sonya and Chun Li could have worked... kind of. Still pointless, tho. <div class="forumQuote"><b>Thracian_Tsar Wrote:</b><br/>I answered four of your questions: <br/><br/> <br/><br/>1. Which one had the bigger impact at the time of their debut? (Impact on who/what? Kitana has more impact ON ME. There you go...) <br/><br/><br/>2. Which one is more popular among MK fans...? (Chun Li has nothing to do with MK. There you go again...) <br/><br/><br/>3. Which one is more popular, and important to their respective series? (Kitana is more important to MK than a non-MK character. Duh...) <br/><br/><br/>4. Who is the better and bigger fighting game icon overall? (Kitana for me. I tend to find Chun Li a generic character in a popular game, hence her "classic" status.) <br/><br/> <br/><br/>It's obvious you don't like my answers. The whole point of your topic is to downgrade Kitana. Why would you compare Kitana to Chun Li? What's next - Ken vs. Kenshi? <br/><br/> <br/><br/>MK's first classic, iconic and only chick was Sonya. A comparisson between Sonya and Chun Li could have worked... kind of. Still pointless, tho.</div> <br/> <br/>My questions are "impact on gamers, impact on non gamers, etc" not "impact on YOU, etc" so no, you did not answer my questions. <br/> <br/>I did not make this thread to downgrade Kitana, in fact, my answers to all the questions would be not all be Chun-Li but drag me!! <br/> <br/>And finally, i find Kitana and Chun-Li much more similar than Sonya/Chun-Li, hence the comparision. My questions are "impact on gamers, impact on non gamers, etc" not "impact on YOU, etc" so no, you did not answer my questions. I did not make this thread to downgrade Kitana, in fact, my answers to all the questions would be not all be Chun-Li but drag me!! And finally, i find Kitana and Chun-Li much more similar than Sonya/Chun-Li, hence the comparision. Trick question. The correct answer is Li Mei. <div class="forumQuote"><b>diirecthit Wrote:</b><br/><br/>My questions are "impact on gamers, impact on non gamers, etc" not "impact on YOU, etc" so no, you did not answer my questions.</div> <br/> <br/>I'm a gamer, so I did answer your questions. <br/> <br/>Also I'm sort of a non-gamer, because I don't follow more than 2 other franchises, namely PoP and C&C (both in hiatus as of now). <br/> <br/>So I speak as a gamer and a non-gamer. Well, I speak for myself, but it's the right thing to do. Speaking for other people and whole communities is plain stupid and arrogant. So is expecting someone to do it. <div class="forumQuote"><b>diirecthit Wrote:</b><br/><br/>Kitana and Chun-Li much more similar than Sonya/Chun-Li, hence the comparision.</div> Oh, now I get it, they both dress in blue... *facepalm*. I'm a gamer, so I did answer your questions. Also I'm sort of a non-gamer, because I don't follow more than 2 other franchises, namely PoP and C&C (both in hiatus as of now). So I speak as a gamer and a non-gamer. Well, I speak for myself, but it's the right thing to do. Speaking for other people and whole communities is plain stupid and arrogant. So is expecting someone to do it. Kitana and Chun-Li much more similar than Sonya/Chun-Li, hence the comparision. Oh, now I get it, they both dress in blue... *facepalm*. <div class="forumQuote"><b>Thracian_Tsar Wrote:</b><br/><div class="forumQuote"><b>diirecthit Wrote:</b><br/><br/>My questions are "impact on gamers, impact on non gamers, etc" not "impact on YOU, etc" so no, you did not answer my questions.</div> <br/><br/> <br/><br/>I'm a gamer, so I did answer your questions. <br/><br/> <br/><br/>Also I'm sort of a non-gamer, because I don't follow more than 2 other franchises, namely PoP and C&C (both in hiatus as of now). <br/><br/> <br/><br/>So I speak as a gamer and a non-gamer. Well, I speak for myself, but it's the right thing to do. Speaking for other people and whole communities is plain stupid and arrogant. So is expecting someone to do it. <br/> <br/><div class="forumQuote"><b>diirecthit Wrote:</b><br/><br/>Kitana and Chun-Li much more similar than Sonya/Chun-Li, hence the comparision.</div> <br/> <br/>Oh, now I get it, they both dress in blue... *facepalm*.</div> <br/> <br/>If "wearing blue" is all the similarity you see, then a *facepalm* for you. But then again, you don't follow SF so move on and stay on topic. If "wearing blue" is all the similarity you see, then a *facepalm* for you. But then again, you don't follow SF so move on and stay on topic. This has nothing to do with MKX so I'm moving it. <br/> <br/>And Chun Li had far more impact than Kitana. With Chun being the first female fighter and all. <br/> <br/>But J-R is right. Cammy is the better female anyways. This has nothing to do with MKX so I'm moving it. And Chun Li had far more impact than Kitana. With Chun being the first female fighter and all. But J-R is right. Cammy is the better female anyways. Chun-Li has more impact than Kitana do to the fact that Chun-Li was the first playable female character to appear in a 1-on-1 fighting game when she debuted in Street Fighter II back in 1991. Otherwise in terms of story impact Kitana has Chun-Li beat by spades.